The author at work at a lathe in Andy Jackson's shop. Fred tells us that he rests two days between workouts and does about eight exercises in his workouts, plus some neck and waist work. He is primarily interested in strength. He usually does three sets, the first light, then two heavy sets. He says more than this leaves him tired the next day. He is 46 years of age and still making gains. He uses partial movements and does half squats with 800, power deadlifts with 650, strength bench presses with 525, half curls with 315, barbell shrugs with 335 and leg extensions with 125. 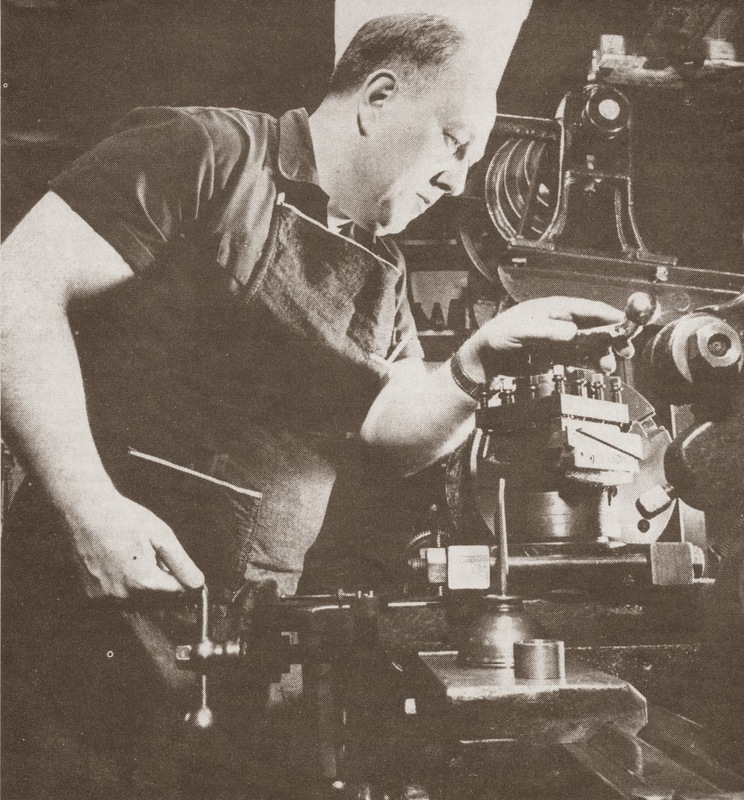 Walter Good, a champion lifter from many years ago, is also a 'working man' and is shown here at a lathe in his machine shop. The three Good brothers were among the most popular strongmen of their time and all were men who performed hard physical work for their living and still were able to be champions. Walter still works a full day and then takes a weight workout for good health and firm, strong muscles. Many readers have asked for information about training for men who work physically for a living as many of you do and we hope this article is of help. Just make the necessary adjustments and keep at it. - Peary Rader. You can build glowing health, large muscles and powerful strength and still hold a full-time job. I had just finished the Assirati neck exercise, the last of my routine, and was about to go and take a shower, when the side doorbell rang. When I opened the door in walked Jack Henderson, an old time exercise pal with big problems. I asked what was wrong and he said, "I was laid off my job and had to take another in a factory. I just don't have the energy to take three hour workouts anymore, so I quit exercise." "Look, Jack, you've been reading too many goofy muscle magazines!" You can make excellent gains with a short routine that won't use up hours of time and make you physically exhausted for three days." "Yes, but it says in this magazine you have to do a dozen sets for each body part and the darn routines take two or three hours." "Sure, they say that, Jack, but I wonder if the author ever put in eight hours a day on a production line of had to work in an office under tension all day long. Many such routines break down more tissue than can possible be built up between workouts and the only reward from them is extreme exhaustion. I notice you have lost a few pounds since the last time I say you." "I sure did, in fact about 10 pounds. I tried to use on of those super routines but after five weeks I was so tired day after day I gave up barbells completely." "Give me a couple days, Jack, and I'll map out a routine that will add some beef to your frame and size to your muscles. Maybe we can even get rid of those bags under your eyes!" If you find yourself, like Jack Henderson, making excuses to skip workouts, it may be your routine is too long for the energy you have left after a hard day's work. Fantasy muscle magazines have chased away many potential exercise fans and discouraged those of us who must work for a living from even trying to follow a barbell routine. But you can, by careful planning, and a good routine, make outstanding gains in health, muscle and strength. First you must consider your job. The routine must not leave you so tired the next day you can't work. Then take into consideration the mental strain a job may give to you. Not only must you do your job, but there can be ill treatment, politics and favoritism which in turn could cause tension and personal depression. Tension, anger and depression can slow down your exercise gains by upsetting the chemical system of your body. Should you tell your boss or coworkers you lift barbells? Maybe not, for it can cause animosity or just plain jealousy in others. Also it may tag you as the company mule and get you all the rough jobs no one else can do! Be sure to lift correctly any heavy material you must handle. Remember at work you many not have a chance to warm up like you can when you take your workout. Bend those legs, keep your back straight and don't be sloppy in the way you handle your job. You must protect yourself at work as your employer couldn't care less. 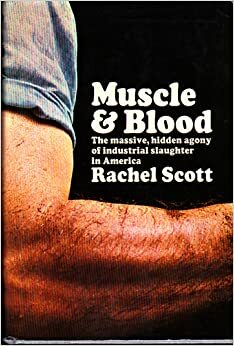 In the book Muscle and Blood many examples were given to show how men were hurt on the job by carelessness on their part and an 'I don't care' attitude on the part of the employer. If you work shifts, you must take into consideration just how much sleep you will get and how the shift work will affect your food intake. A job is not at all like they tell you in high school or college. There are still plenty of rugged jobs around and because of today's job situation you may at some time in your life just be forced to take one. For example, your editor, Peary Rader, spent many years at day labor with the railroad when he was younger. Later on in life when he went into the printing business he still had plenty of heavy physical work to do. Even today he does a lot of hard work preparing weights for shipment, unloading weights and paper, and hauling paper back and forth as it is printed and prepared for shipment. His solution was to design abbreviated, intense programs, shorter workout periods and fewer workouts per week. He found the best time for his heavy workout was on a weekend when he would have more time to rest and recuperate. With two workouts per week he gained very well regardless of the fact that he was doing hard heavy work. In fact, he went from 128 lbs to 210, and won some weightlifting contests too! James E. Douglass, water superintendent for Monticello, Utah, has at the same time also run a part-time gym in his home and still made excellent gains from exercise. Also, he had to recover from a bout with polio. Jim was able to gain from 120 lbs to around 185 with very small bones. Jim had this to say about exercise and work, "I made my best gains while working as a timber man in the mines. This was heavy work for short periods of time. I usually worked out twice a week or five times in two weeks. I think heavy workouts of about one hour are best, using about 8 to 10 exercises and not over 3 sets of any one exercise. The only exception possibly is when doing heavy squats of about 5 reps, then 5 or 6 sets should be done. "After reading some articles by Joe Hise and carrying on correspondence with him, I concentrated more on squats, hopper deadlifts, one arm presses, Eell's pullovers and of course shrugs with the hula hoop [magic circle]. I used the squat for 20 to 25 reps, one set, when trying to gain weight and as I said before, in sets of 5 when looking for extra strength gains. I found a tranquil mind is of utmost importance and this is hard to accomplish when holding down a job and taking care of a home." Jim has a chest of 47 inches or more and had the measurement when pectoral and lat exercise wasn't the rage! He found that heavy rep squats were uncomfortable with a heavy bar across his shoulders and it developed too much lower rib cage, so he put his mind to work and invented the magic circle. Leo Murdock, former gym owner and now physical therapist doing rehabilitation work had this to say about exercise and work. "My routine takes about an hour to an hour and a quarter. I usually train Monday, Wednesday and Friday or Saturday. I currently hold down one full-time job and two part-time jobs. I now train in the evening and when time did not permit, I trained extra heavy two nights per week, usually Tuesday and Friday, doing the bench press, behind the neck press, bent arm pullover, bent-over rowing, and curls. I usually did 1 set of 5 reps, added poundage and shot up to singles, according to the way I felt. Sometimes I varied the routine by adding squats or deadlifts. For strength, power and bulk, two times per week is best when working a full-time job. When trying to reduce and just feel fit, I find extra-light weights should be used daily. If is use a bulk and power routine I add extra milk and ice cream to my diet. I also try to think up new hi-protein type drinks to help me add bodyweight. I found exercise with barbells gave me great energy and made hard work easier." Earl K. Strout, a long-time strongman, farmer and worker in a shoe factory said, "When working in a shoe factory my training was irregular, but I always had to have a minimum of two workouts per week. I might even hit four or five per week, but none of those two or three hour workouts. Between 30 minutes to an hour is plenty. I usually did one set per exercise with the exception of the Hise shrug and squats in which an extra set of two or each would be necessary. I concentrated on bodybuilding and power exercises, also used curls, a few overhead lifts and the bench press once in a while. Deadlifts took so much energy I didn't do enough of them as there just wasn't enough time for sleep, for recuperation from the deadlifting, plus long hours in the factory and the time it took to commute to and from work. I have used as much as 820 lbs in the Hise shrug. As for diet, plenty of meat and vegetables should be used. Go easy or try to cut out all refined sugar. Diet is very important and I realize it more all the time. I believe barbells to be the best curative medicine invented to help people get healthy and strong." John Grimek, the all-time great in bodybuilding, had some rough jobs before he became famous and the editor of a barbell magazine. In fact, his foreman used to try to overwork him, yet John would go home and toss up the iron after midnight to get in his workouts. Joe Hise, the daddy of the squat, was single and the original vagabond of barbells. Joe had an unusual life style. He would work at such tough jobs as cutting timber, uranium and coal mine work and sweat out two shifts and total 60 hours or more a week. He would save all the money possible and then after a year he would quit working and live on the money he saved. By this method he was able to gain great amount of bodyweight and muscle size. He called this his loaf and work style of exercise. Very few people could follow this way of life, but then Joe Hise was a true barbell character who chose his own life style. 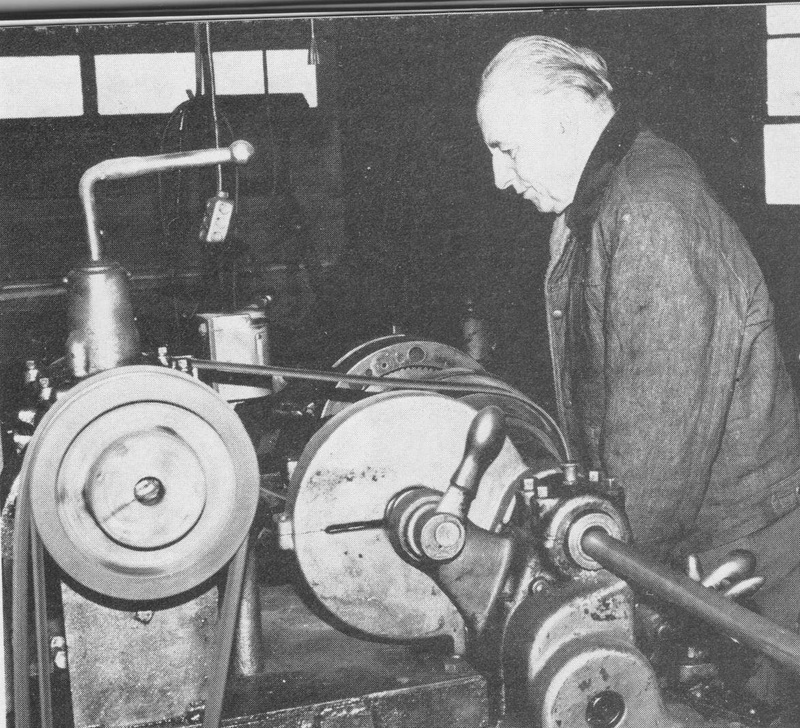 Andy Jackson, former owner of Jackson Barbell Company, used to exercise when working on some of his machines making barbel parts and equipment. Andy would drill out a barbell plate, rush over to a bench and do a set of bench presses and then drill out the next plate or knurl a bar, then back to the bench for the next set of bench presses. Andy, as a one man barbell company, had very little time for personal exercise even though he was surrounded by tons of the best barbell equipment. Dr. Frederick Tilney, a long time barbell fan, writer and health expert, used to exercise during lunch breaks when running the famous mail order course with his former partner, Charles Atlas. Later on in life he went into business for himself in Florida. At 77 years of age he still gives the barbell on his side porch plenty of use. He is busy as ever giving lectures and writing letters to his pupils and just recently he told me he was in intensive training and trying like blazes to get in shape. He also said, "I am better now than the ordinary fellow in his twenties which is pretty good shape for a man 77 plus!" But what has all this got to do with you? It shows it is possible to make tremendous gains from barbell exercise and still work, but it will take some personal planning in your life and a routine that fits your work, energy and life style. Sleep can be the most neglected part of your new life style. To show just how important it is, consider what Alan Stephan, Mr. America said - "Above all, you have to get 8 to 10 hours sleep a night, especially the nights after a hard workout or you can consider half the effort lost." Bernarr Macfadden always preached that one hour's sleep before midnight was worth three hours after midnight. Now, if you're on a rotating shift it can be a problem, but not one that can't be solved. First, be sure you have a firm mattress. Dark curtains or sun shade window blinds to shut out light. Keep the room cool, and if you must sleep while the world is awake, earplugs can help block sounds. Some men have found that, after sleeping part of the day, they get up, have breakfast, rest for an hour while doing light jobs about the house, take a workout, shower, have a snack and then get in a half-hour nap before heading off to the job. Those who work days and come home tired may find a half hour nap will pick up their low energy table and give a power boost. After your nap be sure to shave and wash your face to defeat that groggy feeling so you will be fully awake when you start your routine. It isn't much fun to walk around tired and logy, and you can't do justice to a hard routine without the proper rest. If this means missing your favorite TV program, then you will have to make a choice between exercise results and entertainment. A careful selection of food is a must and nutrition can be a problem only if ignored. At work there will be temptation to follow the crowd and buy catering truck garbage or dog wagon junk! Machines filled with candy, soda, potato chips and white flour products are in most company cafeterias. Every year the food industry gives us 5,000 new items past generations never heard of and most of them are nutritionally inferior or just downright junk! We now have for the shopper, phony milk, cream cheese and orange juice, not to mention just a few of the products loaded with horrible chemicals. Food technologists report that youngsters raised on imitation foods find the taste of some genuine foods objectionable! Dr. Mark Hegsted, a nutritionist at Harvard's School of Public Health, said he could get rid of 30% of the food items on the store shelf without a loss to anyone. One solution to this problem is to bring your own lunch filled with health-giving sandwiches and fruit. A couple of large thermos bottles can carry protein liquid or combination of fruit and vegetable juices. Throw out of your life the junk food such as sugar, white flour, hot dogs, soda cake and fillers called snacks. Look into the fascinating ah-bing-bang-pow world of nutrition. Self-educate, experiment, thrive. It is amazing the amount of food you can eat when working and still not gain weight, if your job involves physical effort. If you're in this category, you must increase the amount and quality of your meals if you are to make fast progress. If you do sedentary, then you will have to watch your diet or you may gain too much weight of the wrong kind. You must do everything you can to make your exercise time a positive experience. Then, when you are pulled toward the TV and that easy chair it won't seem so enticing to skip your workout. If you have been away from training for some time, break into your routine slowly. The first week do only one set of each exercise with 50% of the weight you used to use in your routine. The second week do two sets with the same weight. The third week continue to do two sets but slowly start to increase the weight. By the fourth week you can add weight according to your reaction to each exercise. By using this method you will avoid any unpleasant soreness by out of tone muscles, soft tendons and get back into condition without problems. In any routine you use be sure to warm up. This means doing at least a set or two of light reps for each exercise. This will get the blood moving, oil the joints and prepare the muscles for the hard work to follow. To gain weight with the least amount of energy loss, a routine such as used by Peary Rader and Joe Hise might just work for you. Fast results will by your reward if you will work hard and follow the proper diet. This routine is not meant to make you a bloated marshmallow, but to help you add needed weight in the shortest possible time. When you have gained enough weight, you can then return to an all around routine. 1) Squat. 1 set of 20 reps. Take a barbell across your shoulders and squat up and down breathing in as you squat and exhaling when returning to starting position for the first 10 reps. Then take three deep breaths between each rep until you reach 20 reps. You should then be puffing like a steam engine if you did the exercise correctly. 2) Hise Shrug. Take a barbell across your shoulders and shrug your shoulders. As you shrug take a deep breath and exhale as you relax and lower your shoulders. Do 20-25 reps, 1 set. 3) Two Arm Pullover. You can use a barbell or dumbbells just as long as you do a full 20 reps, 1 set. 4) Deadlift. 15 reps, 1 set. Don't expect to use too much weight in this one, but you can expect great results. 5) Bench Press. 15 reps, 1 set. 6) Curl. 12 reps, 2 sets. You can use dumbbells or a barbell. 7) A neck exercise such as the wrestler's bridge, a calf raise, and one set of your favorite abdominal exercise will round off this routine. A variation of the squat in this routine is to do 1 set of 12 reps, then add weight to the bar and do 1 set of 8. If you prefer to train for bulk and muscle size using sets, the following routine will give you fast results. Each exercise should be done for 5-8 reps, 3 sets. 3) Hise Shrug or Shrug with a barbell held in your hands. 8) Alternate Dumbbell Shoulder Press. 9) Calf Raise using a barbell across the knees. 10) Side Bend or Situp or Leg Raise. For those who want tremendous strength, muscle size and extra bodyweight, and find the average program just doesn't seem to work, a short tough program can be the way to fast results when time and energy are in short supply. You will be surprised how your strength and muscle increase by using a short heavy routine. By conserving energy and not exercising to the exhaustion point, your system has a chance to rebuild and add new tissue. You must guard against overwork or you will find your strength deteriorating rather than gaining. Arthur Saxon, the one time world's strongest man, was said to favor short, heavy workouts. To him anything else was a waste of time. Resting one minute between each set is the best way to reduce excessive stiffness. Such a short rest may reduce your poundage a little for a short time until you get used to the short rest system but it will pay big dividends in the long run. Many strongmen recommend resting from 3 to 5 minutes or longer but this gives the muscles time to cool off and the circulation to slow down which can result in an uncomfortable after-workout feeling. Many working men suffer from muscle fatigue without having the added exercise soreness to contend with on the job. To keep your interest and enthusiasm high, don't be afraid to change an exercise when you get tired of it. If you get bored doing the barbell bench press change and use the dumbbells for bench pressing or do heavy flies. You can use dumbbell curls together or alternate style when barbell curls lose their appeal. When you begin to hate deadlifts, don't just suffer; try rowing for a month land then return to deadlifting. Don't be surprised when you go back to it if you find your strength has increased. After three months on a single set routine using the squat for 20 reps as the master exercise, Jack Henderson had gained 18 lbs and was ready to use a new shaping routine. Jack had to use his legs all day climbing up and down ladders filling machine hoppers and walking on concrete floors so by the end of shift he felt almost too tired just to walk to his car in the lot. He didn't look forward to standing an hour or more doing an exercise routine on those aching feet, so we got together and devised a routine for both size and shape and isolated the muscles for fast results. Jack did 3 sets of 8-10 reps of each exercise. If he was extra tired, he would skip an exercise or two and still get a good workout. Some men have made outstanding progress by concentrating on one body part for a month or two and doing a minimum of exercise for the rest of the body. For example, if you want to concentrate on your arms you might do three of your favorites for the biceps, triceps, triceps, shoulders and forearms doing 3 sets for each exercise, and then round out the routine with deadlifts, squats, shrugs, bench press, situp and a neck exercise. When you have some new beef on the arms you can then switch to the back, legs, chest or whatever part you feel needs extra work. This routine is not for a beginner and a fellow tired from a hard job may find it too much, so he can cut down on the sets. Many stars do one set of six bicep exercises and claim it prevents boredom. Be sure to change your routine every six to eight weeks. Don't make the mistake of becoming lopsided and just a pair of walking arms or lats as some men have done in the past. Staleness is your number one enemy. After about six to eight weeks of steady training you will find the pleasure of exercise will start to drop. You will be looking for an excuse to skip a workout and the weights will begin to feel extra heavy. In fact, if you force yourself to continue training you will yawn and gap your way as you exercise and the poundage on your barbell will have to be reduced! Harry Paschall said he found a week of rest was the best cure after a hard six weeks of training. During your rest time relax and enjoy yourself. Plan a new routine and in a few days, that need to lift barbells will return and you won't be able to stay away from the iron maiden of exercise! The fellow who doesn't go stale just doesn't work hard enough and is a play-around exerciser. Low reps are used in routines to save energy. Yet a few men do favor high reps of 12 or more. This you will have to experiment with if your progress is not to your liking. For example, John (ARMS) McWilliams used 12 reps or more in his routines. A man almost of equal size in the arms, Bud Counts, never used more than 8 reps in his workouts. Years ago higher reps were the thing, then to use more weight and less energy with longer routines, reps retreated to 8 or less. It seems to be a matter of mental outlook and just what feels right for you. The fellow who has to use lots of energy on the job will appreciate fewer reps and the mental uplift of more weight used on the bar. It pays to be healthy and strong. Life on the job is still tough and many men are fired each year because they had the misfortune to become ill. Other reasons are used as the excuse, but absenteeism is the reason. Work has increased in speed and energy output for the employee and he must keep up with machines and fast production times. Just think for a minute what you will miss when you take to time to exercise - doctor bills, hospitals, suffering, pills and a great loss of money and time. As Leo Murdoch sad, "My barbell-built muscles made hard labor a lot less difficult." You don't have to be a second class citizen of the barbell world because you work for a living. With proper planning you can receive large muscles, powerful strength, super energy and sparkling health from your time and effort in exercise. Why not start to plan your routine today!